Do You Know The Hidden Costs Of Running Induction Heat Treating Services In-House? With the powerful benefits induction heat treating adds to the value of your parts – it’s tempting to bring the process in-house. But beyond purchasing the right machinery, there are other expenses to setting up, running and maintaining an induction heat treating system. 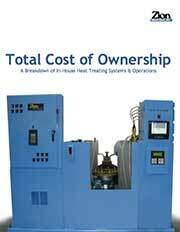 Get a better understanding of the total investment required for an in-house heat induction operation.